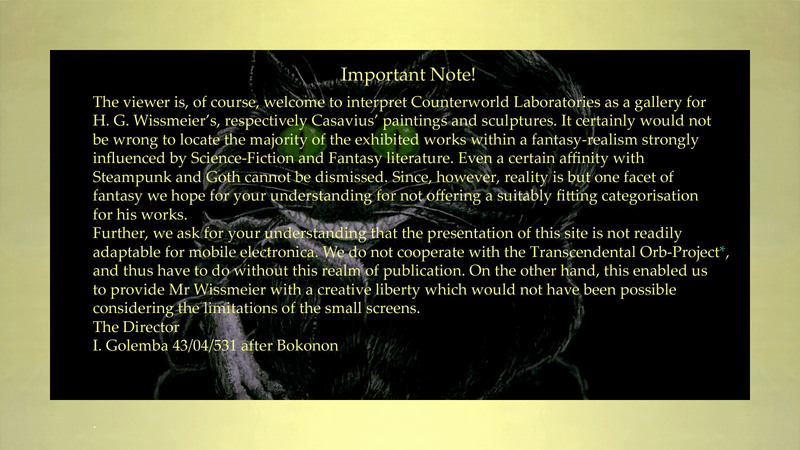 The viewer is, of course, welcome to interpret Counterworld Laboratories as a gallery for Hans. G. Wissmeier's, respectively Casavius' paintings and sculptures. It certainly would not be wrong to locate the majority of the exhibited works within a fantasy-realism strongly influenced by Science-Fiction and Fantasy literature. Even a certain affinity with Steampunk and Goth cannot be dismissed. Since, however, reality is but one facet of fantasy we hope for your understanding for not offering a suitably fitting categorisation for his works. Further, we ask for your understanding that the presentation of this site is not readily adaptable for mobile electronica. We do not cooperate with the Transcendental Orb-Project, and thus have to do without this realm of publication. On the other hand, this enabled us to provide Mr Wissmeier with a creative liberty which would not have been possible considering the limitations of the small screens.